Apple Music has launched a global playlist series that ranks the 100 most popular tracks on the streaming service. Updated daily and based on Apple Music streams, 116 playlists include a Top 100 Global as well as individual lists for each country the streaming service exists in. 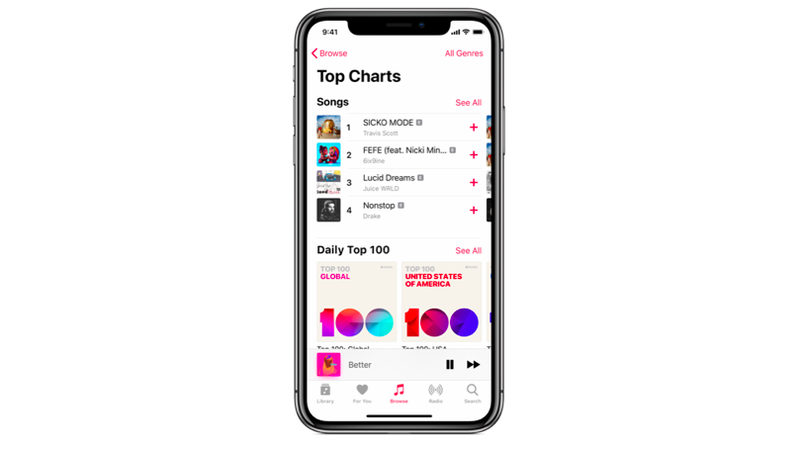 The playlists can be found on Apple Music’s Browse tab inside the Top Charts section, and users can add the Top 100 charts they want to follow to their library or download them to listen offline. They began appearing for all users from Friday (September 7) and daily updates start from 12.00am PST. Right now, Travis Scott with ‘Sicko Mode’ is No.1 on the Global Top 100, followed by ‘FEFE’ by 6ix9ine, ‘Lucky You’ by Eminem, ‘In My Feelings’ by Drake and Eminem’s ‘The Ringer’. The iTunes download charts are still available, which rank the top songs, albums, music videos and concert films. Back in May we reported on the news that Apple Music was building out an entirely new worldwide team to ‘enable data-driven conversations between Apple, labels, artists and the broader industry’ after spotting a job ad for a Charts & Market Analytics Manager. Charts are a major focus of this new team, and the ad revealed that the successful candidate, who appears to have been internal hire Bryce McLaughlin, will ‘define and drive a clear strategy for Apple Music charts, including official charts for music and podcasts’. Spotify launched its Top 50 chart series in 2013, which rank the most popular tracks on the service globally and across 61 countries worldwide. Apple launched its new artist-facing portal, Apple Music for Artists, in March – providing richer behind-the-scenes data to talent and managers.